Definition at line 92 of file RuntimeDyld.h. Allocate a memory block of (at least) the given size suitable for executable code. 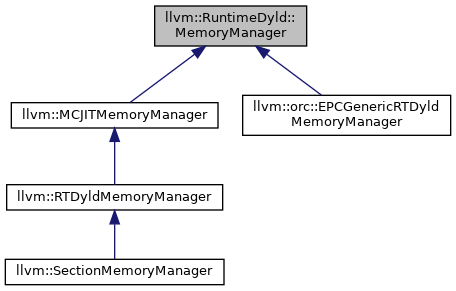 The SectionID is a unique identifier assigned by the RuntimeDyld instance, and optionally recorded by the memory manager to access a loaded section. Implemented in llvm::SectionMemoryManager, and llvm::orc::remote::OrcRemoteTargetClient::RemoteRTDyldMemoryManager. Allocate a memory block of (at least) the given size suitable for data. The SectionID is a unique identifier assigned by the JIT engine, and optionally recorded by the memory manager to access a loaded section. Implemented in llvm::orc::remote::OrcRemoteTargetClient::RemoteRTDyldMemoryManager, and llvm::RTDyldMemoryManager. This method is called when object loading is complete and section page permissions can be applied. It is up to the memory manager implementation to decide whether or not to act on this method. The memory manager will typically allocate all sections as read-write and then apply specific permissions when this method is called. Code sections cannot be executed until this function has been called. In addition, any cache coherency operations needed to reliably use the memory are also performed. Returns true if an error occurred, false otherwise. Implemented in llvm::orc::remote::OrcRemoteTargetClient::RemoteRTDyldMemoryManager, and llvm::SectionMemoryManager. Override to return true to enable the reserveAllocationSpace callback. Definition at line 130 of file RuntimeDyld.h. This method is called after an object has been loaded into memory but before relocations are applied to the loaded sections. Memory managers which are preparing code for execution in an external address space can use this call to remap the section addresses for the newly loaded object. For clients that do not need access to an ExecutionEngine instance this method should be preferred to its cousin MCJITMemoryManager::notifyObjectLoaded as this method is compatible with ORC JIT stacks. Definition at line 164 of file RuntimeDyld.h. References llvm::object::getSymbol(), getSymbolSectionID(), Name, and llvm::RISCVFenceField::O. Register the EH frames with the runtime so that c++ exceptions work. Addr parameter provides the local address of the EH frame section data, while LoadAddr provides the address of the data in the target address space. If the section has not been remapped (which will usually be the case for local execution) these two values will be the same. Referenced by llvm::RuntimeDyldELF::registerEHFrames(), and llvm::RuntimeDyldCOFFX86_64::registerEHFrames(). Inform the memory manager about the total amount of memory required to allocate all sections to be loaded: CodeSize - the total size of all code sections DataSizeRO - the total size of all read-only data sections DataSizeRW - the total size of all read-write data sections. Note that by default the callback is disabled. To enable it redefine the method needsToReserveAllocationSpace to return true. Definition at line 123 of file RuntimeDyld.h. Definition at line 93 of file RuntimeDyld.h.